Ards Camera Club - "Summer Outings 2013"
Club members realised that many had never visited Derry/Londonderry at all and others had just driven through on the way to Donegal. Few had ever walked the City Walls or over the new Peace Bridge. Club members were supported to visit the City to build links with a sister camera club they identified in Derry/Londonderry. “Often the focus in Northern Ireland is on difference and we discovered in the 2011 Census that Ards Area and the City of Derry were opposites based on religious demographics. We decided to focus instead on what we had in common and wanted to meet with another camera club. Pilot’s Row were very welcoming and it was a great opportunity to meet new people and to explore The City of Culture." Over 120 photographs from the group were collated and around 40 will be displayed in an Exhibition in the Sunburst Gallery from 7pm on Thursday 27th June. The vast majority of people on the trip would definitely recommend Derry/Londonderry to friends and were delighted to have this opportunity to build good relations. The high points of the trip were meeting with Pilot's Row Camera Club members, walking the historic Walls and the Peace Bridge and the friendliness of the people. The low point was the rain (nothing new there!) and the amount of scaffolding on some beautiful buildings. Some quotes from members - "If money wasn't a problem, I would definitely try to make the effort to see more of the events planned", "I am looking forward to showing the people of Ards what a fantastic City it is", "Visit Derry with the heart, not the mind." Some members have already booked return trips. You always know it has been a successful trip when someone says the low point is having to leave. 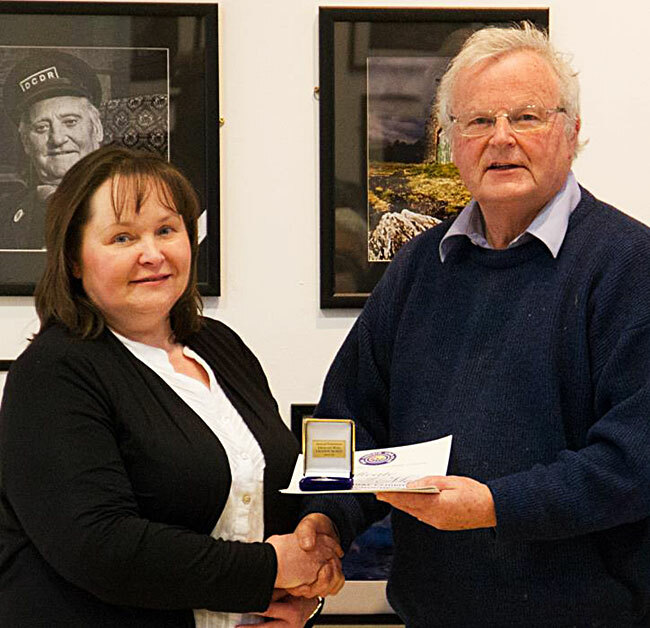 Ards Camera Club's annual exhibition opened on Friday 3rd May and after a very successful year, a wide range of certificates and medals were awarded. Our Judge Kieran Murray ARPS, AIPF, DPAGB praised the quality of the entries and chose Valerie McKee's “Train Driver” as the top print. Amazingly there were over 75 years between the youngest and oldest members who received prizes. Our club is welcoming for all ages and we still all learn a lot from each other. Medals were awarded to the overall winners of the club competitions throughout the year and our thanks go to Kieran for giving us his valuable time and expertise. Our oldest member David S Adair showed us his latest slideshow and this has now become a bit of a tradition at the annual exhibitions. The exhibition will be open until the 31st of May in Ards Arts Centre, Conway Square. Valerie McKee with Judge Kieran Murray ARPS, AIPF, DPAGB. Valerie received Highly Commended and Commended Advanced Colour, 1st Place Advanced Monochrome, and 2nd Place Advanced Projected Digital Image. Also the winner of the exhibition's Top Print for "Train Driver"
Entries for the LegenDerry exhibition must be with Peter by Thursday 9th May. Standard PDI sizes apply but remember to keep the original file for possible printing for the exhibition. LegenDerry Exhibition opening night 7.00 pm Thursday 27th June at Ards Arts Centre. Friday 10th May – Club Members end of year BBQ is now to be held at the Club premises. Meet at the club at 7.30pm. Ards Camera Club's Annual General Meeting was held last Friday. Last year's committee were thanked for all their hard work throughout the year. Highlights of the year included a trip to LegenDerry funded by The Big Lottery Fund, numerous speakers from across Ireland and GB and our new Wednesday evening practical program which was highly praised by attendees. Friday 3rd May – Opening night and presentation of awards for Ards Camera Club Annual Exhibition 2013. The exhibition will be open throughout the month of May. The opening night is always a great night and everyone's welcome, so come down and join us at Ards Arts Centre, Conway Square on Friday 3rd May at 7.30pm. The City of Belfast Photographic Society exhibition is now open in Dundonald Library (16 Church Road, Dundonald) and will be there until the 31st of May. Friday 10th May – Club end of year BBQ, details have been circulated by email. For more information visit our website, www.ardscameraclub.co.uk, our Facebook page, www.facebook.com/cameraclubards or send an email to the club email, ardscameraclub@yahoo.co.uk. Ards Camera Club was host to a very special guest on Friday 12th April 2013. Irene Froy EFIAP, MPAGB, Hon PAGB, BPE4* gave a talk entitled 'Dawn till Dusk’, a humorous tour of the United Kingdom via her images. It became clear Irene had a very distinctive style and was generous enough to give details of how her images were taken and the post-production process. Her tips were useful and appreciated. The Club would like to thank Irene Froy and her husband for giving such an enjoyable and entertaining talk. Some members of Ards Camera Club were on a trip to LegenDerry at the weekend. Pilot's Row Camera Club gave a presentation of prints which proved inspirational for the next day's shoot. Ards Camera Club would like to thank Pilot's Row Camera Club for making us so welcome and for taking the time to give advice as well as endless patience answering all our questions. More details about the trip in the near future. Friday 19th April 2013 - 'Triptych' competition, 7:45pm, Clubrooms. Please arrive at 7:30pm to book in your entry. Refreshments provided. Tuesday 23rd April 2013 - 'Tour of Media Department', SERC, Bangor Campus. Details to be announced on Friday and will also be available via Facebook and the website. Wednesday 24th April 2013 - Please keep Wednesday available to help out with framing of exhibition prints from 7:30pm. Confirmation of details via Facebook and website. Friday 26th April 2013 - Annual General Meeting, 7:45pm, Clubrooms. Friday 3rd May 2013 - Opening Night, Ards Camera Club Annual Exhibition, 7:30pm, Townhall. Thursday 27th June 2013 - Opening Night, City of Culture Exhibition, Sunburst Gallery, Newtownards Townhall. A selection of prints from the LegenDerry trip will be on display funded by Big Lottery Culture for All Fund. Details will be announced in the near future. The 'Triptych' competition is an in-house fun competition and always a good night's craic. There are high expectations of something a little different for the entries. Please book in your entries from 7:30pm for a 7:45pm start. Come along and support your Club. It will be an entertaining night as always. Further details are available via our website, www.ardscameraclub.co.uk, our Facebook page, www.facebook.co.uk/cameraclubards or our Club email, ardscameraclub@yahoo.co.uk. Ards Camera Club would like remind everyone of a few important dates in the near future. Friday 5th April 2013 - 'Auction Night' 7:45 pm, Clubhouse. Friday 12th April 2013 - 'Dawn till Dusk' by Irene Froy, Clubhouse, 7:45 pm sharp. Refreshments provided. This Friday please bring your entries for the exhibition and any unwanted items for the auction. Ards Camera Club would like to wish everyone a very happy Easter. See you all on Friday for a great night's craic. For further information, please see our website www.ardscameraclub.co.uk and our Facebook page www.facebook.com/cameraclubards. Our email is ardscameraclub@yahoo.co.uk. “Sorry, I had to hobble a few pictures together to make up the slideshow.” Alan Cranston began his presentation with a throw away apology, my heart sank. Alan was either extraordinarily humble or had a rather skewered sense of what constitutes as hobbling a few pics together for the presentation elevated my heart, set it pumping and my backside found itself perched precariously on the edge of my seat. As usual I had little to no idea of the complexity of producing the images before me. No comprehension of how to illuminate snow drifts of silt, avoid diver’s bubbles, cope with distorting fish eyed lens or the loss of colour at depth, and that was in the water. Little mention of the complexity of the equipment required to shoot this level of photography and the logistics of transporting it to Egypt, the Maldives or Malta. To be honest at some stage I stopped caring for the underwater adventure that Alan courteously invited us upon burst to life before us in the form of lava-like orange-reds of soft coral in the Red Sea. Rainbow coloured hues wafting in the blue depths, anchored to the remaining carcass of a long ago sunken wreck. We stared unbelieving at the SS Thistlegorm’s buried cargo of old Bedford trucks once on their way to fight in North Africa, khaki colours enhanced by a spray of green algae, rows of BSA motorbikes upturned, spokes, tyres, petrol tanks forming an underwater art installation. Black wellington boots scattered like so many of their intended wearers refusing to disintegrate, everlasting blobs of rubber marring their marine resting place. Marine life flashed before us - shoals of silver bullets twisting in the blue depths, crocodile fish camouflaged, little “lace blinds” covering deadly eyes, coral trout magnificent in their orange-red uniforms, splattered with luminescent blue splotches. Poisonous scorpion fish almost invisible in their lairs, blue spotted ray, open mouthed moray eels twisting bodies waiting for their next victim, magnificent deadly spiked lion fish, huge Napoleon rasps spanning a metre across and up to two metres long. Pink tinged blues of trigger fish contrasted with the glorious reds of folding skirts on sea anemones and the flashing twirls of the flamenco like frills of tiny Spanish Dancer fish. Incredible images of turtles bringing scenes of Finding Nemo to life in the small confines of Ards Camera Club and then cue the dedum dedum music for in front of our eyes “only a foot away” sailed the great dead-eyed bulk of an Oceanic White-tipped shark. Alan makes underwater photography look simple, his modest demeanour makes you believe anyone can do this but his images speak volumes in their stunning beauty, the magnificence of their subject matter and the respect he holds for it. On Friday evening his private view behind mask and camera came alive in front on an enthralled audience that was hungry for knowledge about his marine adventure, almost more so than for the art of his photography. Alan’s images rival any Attenborough BBC natural history documentary, I truly feel sorry for those of you that missed it. Wednesday, 20 March - NIPA Round 5 hosted by Dungannon/Cookstown club. Another starred print for Ards. See 'events' page for details of venue. Wednesday, 27 March - No meeting. Easter Holidays. Friday, 29 March - No meeting. Easter Holidays. Wednesday, 3 April - No meeting. Easter Holidays. • Closing date for entries into Ards Camera Club Annual Exhibition. • Also this is 'Auction Night' in the camera club so don't forget to have a look around and see if you have any unwanted presents, etc which you want to put into the auction. Friday 8th March 2013 was a studio night and there was a buzz as it was to be a male model. Our own awarding winning portrait photographer, Alan Reid, provided the expertise, equipment and brought along James. James was very patient with us lining up to take photos, and had brought along a choice of accessories including a selection of hats, jackets and pipes. The Club would like to thank James for being such a charming and patient model. Tea-break brought forth a little excitement for Peter Brown. Peter is a long time member of Ards Camera Club and is leaving for England in the very near future. Peter was presented with Honorary Lifetime Membership, special cakes and with a specially commissioned T-shirt with a one off printed photo. The photo was created by one of our members (see website and Facebook page for photos of presentation.) 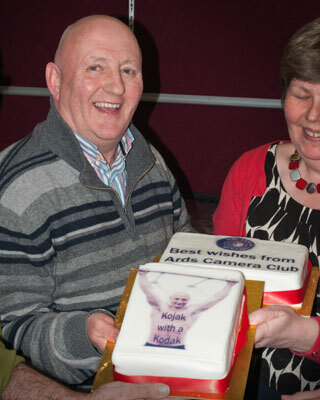 Ards Camera Club would like to thank Peter for his support and friendship over the years and to wish him and his wife, Jean, all the best for their future. You will be missed especially for your sense of humour. Friday 15th March 2013 - 'Underwater Photography' by Alan Cranston, 7:45pm sharp, Clubrooms. Refreshments provided. Wednesday 20th March 2013 - Northern Ireland Photographic Association (NIPA) Inter-Club Round 5 'Documentary', Dungannon/Cookstown. See website for details. Wednesday 20th March 2013 - 'Using Photoshop to Improve Depth of Field' 7:30pm, Clubrooms. Refreshments provided. Friday 22nd March 2013 - 'Celebrating Indian Culture Through Photography' 7:30pm sharp, Clubrooms. Details for competition on website. Friday 5th April 2013 - Closing date for entries to Ards Camera Club Annual Exhibition 2013. See website for rules, conditions and entry forms. This Friday 15th March 2013, Ards Camera Club welcomes back Alan Cranston, to give a talk on his stunning underwater photography. He has visited the Club in the past to much acclaim and has come back to give an update. His images will not disappoint. Come along for a good night's craic interspersed with stunning images. Ards Camera Club had not one, not two but were graced with the presence of five speakers on Friday 1st March 2013. Our Club Chairman had the privilege to introduce Barry Lau, Chair of Belfast Photo Imaging Club, (BPIC), Jaime Campbell Valente, Helen Weir, both BPIC, Melissa Gordon and Martin Courtney, both from Catchlight Camera Club. All were members of BPIC when they put forward their panels for the various qualifications. The opening for the night was with Barry who gained his ARPS, Associateship of Royal Photographic Society, where 15 images were put before a panel of judges, in this case via projected digital images which must have a theme as well as flow and continuity, high level of competence both in camera and computer manipulation and overall high quality. This was ably demonstrated with Barry's panel of portraits and environmental portraits. The Licentiateship for both the Royal Photographic Society (RPS) and Irish Photographic Federation (IFP) consists of submitting a panel of 10 images, this time all three chose prints, LRPS and LIPF respectively. Helen's panel showed a love of colour and pattern while Jaime's panel showed predominantly a love of monochrome and flowers. Melissa's panel was a mixture of landscapes, as well as portraits of adults and children. The best was saved for last with Martin's panel of 20 monochrome prints. He bravely put up a rejected panel first followed by the accepted panel. When some of the rejected photos were shown, it gave an idea of the hard work which went on behind the scenes to put together any of these panels. Martin's panel was for AIPF with the theme 'Ageing.' There was banter throughout the night but was particularly good with Martin and he gave as good as he got. Our thanks go to all the participants for making it such a good night, for giving inspiration and a comment from the floor summed up the feeling on the night, "It was brilliant." Friday 8th March 2013 - Special General Meeting at 7:30pm sharp ie before normal meeting, Clubrooms. This is to vote on an important change to the constitution of the Club. Friday 8th March 2013 - Practical night 7:45pm, Clubrooms. Bring your camera. Refreshments provided. Wednesday 13th March 2013 - Theme 'Depth of Field' Theory discussion and Tutorials, 7:30pm, Clubrooms. Refreshments provided. Bring your camera just in case. The Special General Meeting is important as this is YOUR club and it is a vote on an important change which will affect future issues in the running of the Club. Please support YOUR club. There is a buzz for the practical night this time as the word on the grapevine is it is to be a male model. Ladies and gentlemen bring along your cameras for a fun night. The craic was mighty last week and it is sure to be just as good this Friday. Further details are available via our website, www.ardscameraclub.co.uk our Facebook page, www.facebook.co.uk/cameraclubards or our Club email, ardscameraclub@yahoo.co.uk. from Belfast Photo Imaging Club (BPIC) was asked to critique the photos before the members voted on the top images and which ones were to go forward to the NIPA Inter-Club Round. 'Isolation' - Stephen Weatherall, 'Water Aid' Patricia Mackey.
' The Reckoning' - Stephen Weatherall. 'Best Seat in the House' - Valerie McKee. Congratulations to everyone who had entries accepted for NIPA Exhibition 2013 especially to our very own Valerie McKee who had a colour print chosen for acceptance. This is a prestigious honour as only 75 prints in total are chosen to represent Northern Ireland. presented by various new recipients of the RPS and IPF honours, 7:45 pm Clubrooms. Refreshments provided. Wednesday 6th March 2013 - Print Battle Ards Vs City of Belfast, Photographic Society, 7:30 pm, Sandy Row Community Centre, Belfast, BT12 5ER. All entries for print battle to be brought along on the night limited to three per member. Friday 8th March 2013 - 'Practical Night' 7:30 pm, Clubrooms. Bring your camera. Refreshments provided. The RPS and IPF Distinction panels are always interesting as each person has their interpretation. It is always good to look at other people's work as well as the standard required for distinction. The Licentiateship standard is a good all round knowledge and basic skill which is the starting level for most people. There will be also be lots of information available on the night for anyone interested in going for a distinction qualification. Please come along for a good night's craic. See you there! Our esteemed leader Mr Armour introduced Ian Lyons to the club on Friday evening as “an old, a very old friend.” Taking past centuries out of the equation Ian delivered his presentation with an endearing gentleness, explaining that his photographs of Wyoming and its infamous Yellowstone National Park were mostly landscapes with the odd twist. I beg to disagree for those twists appeared to me to be in almost every image. Twists of colour, light and exquisite natural beauty that demanded attention. Autumnal colours jumped off the screen in the form of yellow, gold and orange fluffy topped Aspens that waved in front of a backdrop of monochromatic mountains. Jaw-dropping photographs of geysers, run offs, polluted pools, encrusted plateaus, deep gorges and the magnificent Teton mountain range paraded, some like a futuristic movie backdrop. Images such as Opalescent Pool, incredible saturated blue depths surrounded by run offs in burnt browns, rust reds and murky yellows. Black skeletal trees reaching out like gnarled fingers. Lonely corpses stretching hopelessly, roots sunken in toxic plateaus, their futility laughed at by the vibrancy of the grey-blue sky rolling overhead. Throughout the presentation Ian punctuated his photographs with helpful hints, most importantly keep your long range 400mm lens on the camera for “you never know what’s around the corner.” Around the corner appeared images of gargantuan marshmallow-like springs, calcified concoctions of creams, oranges and rusts, water spraying over them in frothy deathly white plumes. White streaked with bacteria and algae, presenting as an ominous green-black detail. The grandeur of the landscape was matched by the magnificence of the beasts that frequent it for before us stood the brown bulk of a grizzly bear turning to glare over a majestic shoulder. Ian explained his own appreciation of the naturalness of his landscapes, how we were viewing them uncropped, virtually no re-touching, “warts and all.” I felt they were even more beautiful for their nakedness. Ian presented us not with a slide show of polished pieces but with a dazzling display of Mother Nature’s savagery, her triumphs and beauty, highlighted by dizzying sunlight dancing off colours that only she can produce. To sum up, you should have been there! Venue - Shorts Recreation Club, Holywood Road, Belfast BT4 1SL. Admission free. Tuesday 26th February - NIPA Inter-club Round 4 ‘Open’ hosted by Carrickfergus Photographic Society. Venue confirmed as The Jubilee Hall, Carrickfergus Civic Centre, 11 Antrim Street, Carrickfergus, BT38 7DG. Jim Crone lulled us last Friday evening into a false sense of relaxation for he had a lot of technical know-how for us to follow. (Great, an opportunity to catch up on forty winks.) Jim, a well-respected fashion photographer began his presentation surprisingly not with a bevy of beautiful ladies but with a breath-taking shot of the equally stunning Mournes, followed by panoramic shots of the Alambra in Spain. From our vantage point we had no inkling as to the amount of detail in the picture of the famous castle until Jim “zoomified.” Suddenly we were confronted not with a wide shot of an ancient building but with figures on the battlements. In the blink of an eye a six mile wide vista reduced to a tourist lighting a cigarette. A definite eye-opener, all hopes of a nap eluded me. We were treated to images inside Gibraltar’s caves, the wildness of Connemara, seascapes in Donegal, the Burren in County Clare before Jim took us on a fairground ride around a 360 degree interactive shot of the Cliffs of Moher, including the dizzying 214 metre drop. Vertigo calmed, we listened as Jim explained the diligence and kit required to obtain these magnificent photographs, mentioning tripods and nodal panoramic tripod heads. He explained about 50 degree overlaps before showing us how he used PT Gui to stitch the shots together. I was quite prepared to be as interested as I am watching paint dry but to my utter amazement pure magic unfolded before me as the computer programme seamlessly blended a multitude of shots in to one exquisite photograph. PT Gui may make stitching look simple but Jim manages to turn hours behind a tripod and patience in front of a computer into an art form. Wednesday, 13 February 2013 @ 7.30pm - Photochat. Practical photography night. Please bring your camera. The festival has an All Ireland competition for the first time so our friends from the IPF can now enter. Friday, 15 February 2013 @ 7.45pm - Ian Lyons – Rocky Mountain Gold. Wednesday, 20 February 2013 @ 7.30pm - Photochat. Using Photoshop to enhance lighting effects. 7.30pm to sign in entries, with prompt start at 7:45pm. Tuesday, 26 February 2013 – NIPA Inter-club Round 4 ‘Open’. Venue - Carrickfergus Photographic Society. Wednesday, 27 February 2013 @ 7.30pm - Photochat. ‘Members Photo Night’ - reviewing our own images. After braving Noah-esque floods we settled to listen to our guest speaker renowned photo-journalist Mr Stanley Matchett, MBE FRPS LBIPP. Stanley has successfully dedicated a lifetime’s work to photography, photographing his own streets throughout the troubles for publications such as the Daily Mirror, as well as photographing famous musicians, even royalty. He launched his presentation with good humour in a relaxed, friendly style. Stanley’s presentation focused on past masters of an era before digital camera, an era of Leica, Yashica, Rolleiflex and Hasselblad. We watched Dr Ben Swain, Joan Salem, Reg Perry, Ken McNally and Dr Brian O’Gorman. Masters that extolled the virtues of patience, forethought, minimal lighting, and subject matter minutes from your door step. We marvelled at images that spoke for themselves with eloquence, sublime in their simplicity. Simplicity that knew nothing of Photoshop manipulation, simplicity that screamed of the artistic eye of the photographer. Stanley expressed his admiration for the photographs before us with a passion that belied his years in the art. He encouraged his audience to understand the beauty of a body of work that took patience in the field to capture and dedication in the dark room to produce. He challenged us to think how the advancement of digital technology may have made the production of an image easier with almost limitless shots but with all its technology have we as artists lost something in the translation? Wednesday, 30 January @ 7.30pm at clubrooms – Photoshop – Black & White. Please bring your laptops? Refreshments provided. Friday, 8 February @ 7.45pm at clubrooms should be another fantastic night with Mr Jim Crone speaking on ‘360º & Panoramic Photography’. Jim, a well respected photographer in fashion, hair and beauty genre of photography, has visited our club on many occasions and is sure to draw a great crowd of members with his interesting discussion and willingness to share information and tips on the subject discussed. Ards Camera Club held their Club and Northern Ireland Photographic Association (NIPA) competitions, round 4 'Open'. Harry Pettis from Bangor Camera Club was asked to critique the photos before the members voted on the top images and which ones were to go forward to the NIPA Inter-Club Round. 'Clare Glen' - Rusty Adair, 'Blue Tailed Damselfly' - Valerie McKee. 'Owl Eyes' - Robert Graham, 'A Walk In The Park' - Carole Watson. 'Baler Twine' - Stephen Weatherall, 'The Crusher' - Rusty Adair, 'Cornflower Medley' - Valerie McKee, 'Robin at Mount Stewart' - Linda Hutchinson. Friday 25th January 2013 - 'Art of Photography' by Stanley Matchett MBE FRPS LBIPP, Clubrooms, 7:45 pm. Refreshments provided. Deadline for entries to NIPA Exhibition to be handed with fee to Peter Knott. Wednesday 30th January 2013 - Photochat topic 'Lighting' , practical night, Clubrooms, 7:45pm. Please bring cameras. Refreshments provided. Friday 1st February 2013 - NIPA Inerclub Round 3 'Triangles', Belfast Photo Imaging Club, Lorne Street, Belfast. Directions on our website. Viewing from 7:30 pm. Stanley Matchett MBE FRPS LBIPP has been a professional photographer for many years and is known internationally for his work. His talks are always entertaining, especially with the stories about the many famous people he has photographed over the years. Please come along to a good night out. Ards Camera Club starts the second half of the season this Friday, 4th January 2013. Roland White will be at the Club to give a talk entitled 'Sports & Things', 7:45 pm, Clubrooms. Friday 4th January 2013 - Closing Date for entries to Northern Ireland Photographic Association (NIPA) Novice Competition. See ‘info’ page of website for Rules and Entry form. Friday 4th January 2013 - Closing Date for entries to NIPA Print and PDI Exhibition 2013. See ‘info’ page of website for Rules and Entry form. Tuesday 8th January 2013 - Will McCrum Memorial Cup, Morton Community Centre, Lorne Street, Belfast BT9 7DU at 7:30pm. Wednesday 9th January 2013 - 'Black & White' Theme, theory discussion, and tutorials, 7:30pm, Clubrooms. Refreshments provided. Friday 11th January 2013 - 'A Night with Stan & Kate McIlreavy', 7:45pm, Clubrooms. Refreshments provided. Ards Camera Club would like to take this opportunity to wish everyone a Happy New Year and welcome everyone to our first New Year meeting. See you there. Please check our website and Facebook page for up-to-the-minute news. Further details are available on our website www.ardscameraclub.co.uk, our Facebook page, www.facebook.com/cameraclubards and also can be contacted through our Club email, ardscameraclub@yahoo.co.uk. On Friday 14th December 2012, Ards Camera Club held its last meeting before Christmas which was Round 3 Northern Ireland Photographic Association (NIPA) Competition as well as the Club competition. The small but enthusiastic audience were the judges. Our guest speaker for the night was Vittorio Silvestri, Central Photographic Association (CPA) one of the oldest clubs in Northern Ireland dating back to 1906. Vittorio gave his comments on each section and the audience voted for their choice. Friday 30th November 2012 - 27th December 2012 - Ards Camera Club Exhibition Selection, Cregagh Library. Viewing during normal library opening hours. Friday 4th January 2013 - Closing Date for entries to NIPA Novice Competition. Friday 4th January 2013 - Closing Date for entries to NIPA Print and PDI Exhibition 2013. Friday 4th January 2013 - Roland White 'Sports & Things', Clubrooms, 7:45 pm. Refreshments provided. Congratulations to everyone who put in an entry, to those who were placed and to those whose images were chosen for NIPA. Further details are available on our website, www.ardscameraclub.co.uk, our Facebook page, www.facebook.com/cameraclubards and also can be contacted through our Club email, ardscameraclub@yahoo.co.uk. On Friday 30th November 2012, Graham Chambers gave a talk on rally photography to Ards Camera Club. The Club would like to thank Graham for sharing his enthusiasm and love of rally photography. The Annual Christmas Dinner was held in Sugarcane, The Square, Comber. The level of noise in the form of laughter was definitely an indicator of a very good night. The Club would like to thank the staff for the great food and excellent service. 14th December 2012 - Round 3 Northern Ireland Photographic Association (NIPA) competition., Clubrooms. Prompt start at 7.45pm. The theme is triangles. All entries to be signed in from 7:30pm. Refreshments provided. 3rd December 2012 - 28th December 2012 Selected Exhibition Entries, Cregagh Library. Viewing during normal library opening hours. Round 3 NIPA competition is this Friday 14th December 2012. Please sign in entries from 7:30pm for a prompt start at 7:45pm. Everyone welcome. Ards Camera Club would like to congratulate all those who were selected to go through to Round 2 Inter-Club competition. Valerie McKee 'Watching You', Andrew McKee 'Peek-a-Boo Holly', and Leslie Armour 'Picketed Fence', all of whom got starred images. Also congratulations to Anne Given (Ballynahinch), Peter Irvine (Fairhead), Hugh Wilkinson (Ballynahinch) and our own Peter Knott, who were successful in the Photographic Alliance of Great Britain (PAGB) Awards adjudication at Ashfield Girls School on weekend of 24th and 25th November 2012. Friday 7th December 2012 - Ards Camera Club Annual Christmas Dinner, Sugarcane, The Square, Comber, at 7pm. Wednesday 12th November 2012 - Photochat theme 'Using Photoshop, Focusing on Shutter Speed', Clubrooms, 7:30pm. Refreshments provided. Friday 14th December 2012 - Round 3 'Triangles', Clubrooms, 7:30 pm to sign in entries, with prompt start at 7:45pm. Ards Camera Club Christmas Dinner is scheduled for Friday 7th December 2012, Sugarcane, The Square, Comber. Please meet at 7pm for 7:15pm. Ards Camera Club would like to take this opportunity to wish everyone a very Merry Christmas. The Northern Ireland Photographic Association (NIPA) held the ‘Roy Finlay Memorial Natural History Competition', hosted by Ards Camera Club at the Wildfowl and Wetlands Trust, (WWT), Castle Espie, Ballydrain Road, Comber. There was a full room for the competition showing how keen the interest is in the genre of natural history photography. The viewing was from 7pm and was appreciated by our many visitors. The results of the competition will be posted on the NIPA website, www.niphoto.co.uk with thanks to the esteemed judge, Jack Malins, natural history photographer. Friday 30th November 2012 - 'Rally Photography' by Graham Chambers, Clubrooms, 7:30 pm. Refreshments provided. Wednesday 5th December 2012 - Photochat theme 'Shutter Speed', Clubrooms, 7:30 pm. Refreshments provided. Please bring your camera. Friday 7th December 2012 - Annual Christmas Dinner 2012, Sugarcane, The Square, Comber. Please meet 7pm for 7:15pm. Will McCrum Memorial Cup Closing Date: Tuesday 4th December 2012 - Entries should be left with Vittorio Silvestri before 4th December 2012. Email vittorio@vsilvestri.com. Friday 30th November 2012 - 27th December 2012 - Ards Camera Club Exhibition Selection, Cregagh Library. Viewing during normal opening hours. This Friday Ards Camera Club welcomes Graham Chambers, a keen amateur photographer with a passion for photographing rally cars around the world. He will discuss some of the highlights as well as disadvantages of this type of photography. It promises to be an interesting night. Please come along. All welcome. Ards Camera Club Chairperson, Leslie Armour, introduced Ernie Patterson from Central Photographic Association, (CPA), to give a talk entitled 'Digital Workshop.' The entire room was under the impression it was to be a talk on Photoshop. However, the talk was from a unique perspective, a synopsis of the history of the invention of stereoscopic photography known today as 3D photography, how it helped win World War II (WWII), how to make 3D photos and then a short talk on scanography with practical applications. The most intriguing part was the 3D NASA photos when viewed through the '3D glasses.' The scanography talk showed how everyday objects could be used to make art via an ordinary scanner and also how to measure depth of field on the scanner. The talk was from a unique point of view and made for a most entertaining night. Ards Camera Club would like to thank Ernie for giving such a fascinating talk. Friday 23rd November 2012 - Northern Ireland Photography Association (NIPA) presents Roy Finlay Memorial Natural History Competition. Venue is Castle Espie, 78 Ballydrain Road, Comber, BT23 6EA. See website for map. Viewing from 7pm with 7:30pm prompt start. Wednesday 28th November 2012 - Photochat theme 'Night Photography Discussion and Image Review'. Clubrooms, 7:45pm. Refreshments provided. Wednesday 28th November 2012 - NIPA Inter-Club Round 2 (Open), Antrim Camera Club. Details on website. Friday 30th November 2012 - 'Rally Photography' by Graham Chambers, Clubrooms, 7:45pm. Refreshments provided. 2nd - Thursday 29th November 2012 - Ards Camera Club Exhibition Selection, Dundonald Library. Viewing during normal opening hours. The exhibition will be taken down in Dundonald library on Friday 30th November 2012. The Club needs volunteers. If you are available and would like to help, please contact Valerie or any committee member. NIPA Roy Finlay Memorial Natural History Competition is an annual event hosted by Ards Camera Club, and will take place at Castle Espie Wetland Centre. Viewing will be from 7pm with a prompt start at 7:30pm. Please come along to see some superb wildlife shots as well to support your club. On Friday 9th November 2012, Ards Camera Club members were taken on a journey, firstly around Ireland and then to the far side of the world. Kieran Murray ARPS, DPAGB, APAGB, brought along his travel photos. Firstly it was around the Holy Wells of Ireland including County Westmeath, Clare and Donegal. Then it was onto the other side of the world on an exciting trip to the streets of Rajasthan and the captivating sights of Kathmandu. Nepal may be one of the poorest countries in the world but the joy and happiness of the people showed through in the portraits. The vibrant colours reflected the amazing characters who were photographed. The Club would like to thank Kieran for bringing along his photos and giving such an exciting and entertaining talk as usual and for travelling from Banbridge to do so. Friday 16th November 2012 - 'Digital Workshop' a talk by Ernie Patterson, Clubrooms, 7:45pm. Refreshments will be provided. Wednesday 21st November 2012 - Photochat 'Using Photoshop to Edit Night Photography,' Clubrooms, 7:45pm. Refreshments will be provided. Friday 23rd November 2012 - Roy Finlay Memorial Natural History Competition, Castle Espie Wetland Centre, Comber, 7:30pm sharp. Viewing from 7pm. See website for map. Wednesday 28th November 2012 - Photochat 'Discussion Evening and Image Review of Night photography Outing,' Clubrooms, 7:45 pm. Refreshments will be provided. Ernie Patterson, an enthusiastic member of Central Photographic Association (CPA) will be giving a talk on Photoshop this Friday 16th November 2012. As programs such a Photoshop are now our digital darkroom, this will be interesting on so many levels, from the beginner who wants to crop and resize images whilst keeping proportions, through to the advanced level of using layers, masks, etc. Please come along for an informative and entertaining night. Everyone is welcome. On Friday 2nd November 2012, David S Adair (Sinclair), ARPS, was invited to give a talk on his slideshows and photos. 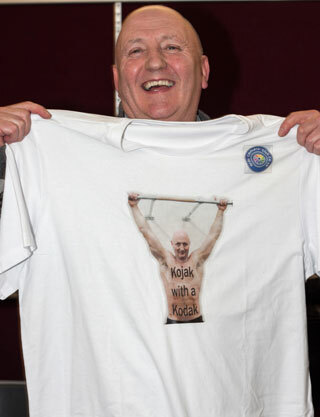 He is a life member of the Club and quite a character with a unique view of the world and a lively sense of humour. This was reflected in the work shown. The second half had a more sombre serious tone, including his own memorial slideshow. The Club members showed their enthusiastic appreciation of the talk and the Club would like to extend it's thanks to him for coming along. Friday 9th November 2012 - 'My Travel Selection' by Kieran Murray, 7:45pm, Clubrooms. Refreshments provided. Wednesday 14th November 2012 - 'Photochat 'Introduction to Night Photography Club Outing,' 7:45pm. Meet at Clubrooms. Friday 16th November 2012 - 'Digital Workshop' by Ernie Patterson, 7:45pm, Clubrooms. Refreshments provided. Friday 2nd November - Thursday 29th October 2012 - Ards Camera Club Annual Exhibition, Dundonald Library, normal opening hours. The details of the Wednesday Night outing will be announced this Friday 9th November 2012, on Facebook and via our website (see below for details of addresses.) Kieran Murray ARPS, DPAGB, APAGB, will be giving a presentation on his travels this Friday. Kieran is a long time member of Banbridge Camera Club and has been taking photographs for over 50 years. The combination of retirement and a love of travel and photography, has resulted in going to as far afield as India and as close to home as the Mournes. Please come along to benefit from his wealth of experience and to enjoy his beautiful collection of photos. All welcome. Friday 26th October 2012 was the Club competition and for Northern Ireland Photographic Association (NIPA) Round 2 'Open' theme entries. Raymond Hughes DPAGB, AIPF, LRPS, active member of Merville Photographic Club, was asked to give comments on each section, Colour prints; General and Advanced. Monochrome prints; General and Advanced and also Projected Digital Images (PDI); General and Advanced. He gave some very helpful tips as well as entertaining with his stories of taking photos similar to a few of the entries. The system used involved audience participation, where the members viewed the prints taking on board the comments and voted for their choice in each section. 'We Have the Power' - Rusty Adair, 'Dandelion' - Brian Kay. 'Picketed House' - Leslie Armour, 'Forgotten' - Ted McKee. 'I'm Watching You' - Valerie McKee, 'Stones at Sunrise' - Ted McKee. Thanks go to Raymond Hughes for coming down and giving us the benefit of his comments and photographic wisdom. Friday 2nd November 2012 - Talk by David S Adair (Sinclair) ARPS, AIPF 'Mural & Urban Art' 7:45pm sharp, Clubrooms. Entries for Roy Finlay Competition due this Friday 2nd November 2012. Entries to be given to Peter Knott with the appropriate fees and paperwork. Wednesday 7th November 2012 - Photochat 'Night Photography'Discussion and tutorials, 7:45pm. Refreshments provided. Friday 9th November 2012 - 'My Travel Selection' Kieran Murray, 7:45pm sharp, Clubrooms. David S Adair ARPS, AIPF known as Sinclair, is a life member of the Club and always gives a unique and entertaining talk. His shows are humorous with good music. Please come along and give your support. Everyone welcome. On Friday 12th October 2012, Jim Moorland FRPS gave a talk on putting together a panel for the Royal Photographic Society (RPS.) Panels from all levels ie Licentiateship (LRPS), Associateship (ARPS) and Fellowship (FRPS) were shown to give an idea of the expected standard. The panels produced a lot of enthusiasm from members to the point where some went home straight after the talk to browse their archives for suitable images. As always, Jim gave an entertaining talk and the Club would like to thank Jim for such an enjoyable night. The following Friday, 19th October 2012, Ards Camera Club hosted a talk by Paul McCambridge, a well respected local photojournalist among other things. He has many publications, exhibitons and photographic press awards, including 'Features Photographer of the Year' in 1997, 1999 and 2003. His talk was excellent with both projected digital images and prints, showing his current projects. Again the Club would like to thank Paul for bringing along his images and look forward to seeing his images of India in the future. The Club also had a successful outing to Performance Physio Club on Monday 22nd October 2012. The Club was invited to take photos of Sam, the owner and Marianne Kane. Thanks go to our two excellent models and to everyone who turned up. It was a very good night out giving lots of practice using studio lights 'in situ.' Hopefully the Club will have some good photos to show Sam and Marianne in the near future. Members should bring their five best images on a disc or USB stick to the Club on Wednesday 7th November 2012. Thursday 25th October 2012 - Northern Ireland Photographic Association (NIPA) Inter-Club Round 1 'Open', at Christian Brothers Past Pupils Union Camera Club (CBPPUCC) at 7:30 pm. Friday 26th October 2012 - Round 2 'Open', Ards Camera Club, 7:45 pm sharp. Please arrive early to sign in your entries. Thursday 4th - Saturday 27th October 2012 - Ards Camera Club Annual Exhibition, Comber Library, normal opening hours. Friday 2nd November - Thursday 29 October 2012 - Ards Camera Club Annual Exhibition, Dundonald Library, normal opening hours. Wednesday 31st October 2012 - Photochat 'Using Photoshop to Reduce Noise', 7:45pm, Clubrooms. Refreshments provided. Friday 2nd November 2012 - Talk by Sinclair Adair 'Mural & Urban Art', 7:45pm sharp, Clubrooms. The second NIPA round and our own Club competition which is 'Open' theme will be held on Friday 26th October 2012. As the theme is open, it gives the members a chance to enter shots from any discipline and always gives a huge variety of subject matter. Please come along and help make this a successful night. Everyone welcome, all levels, from those who just want a good night's craic through to those who want that winning shot. On Friday 5th October 2012, there was a change to the programme. After announcements by the Vice-Chairperson, Linda Hutchinson, there was a showing of a photography video on the history of photography which made for interesting viewing. A selection has been made from the exhibition prints and these are now on show at Comber Library during normal opening hours. If you have not seen them, please come along. Sunday 7th October 2012 was our first Autumn outing. There were about 14 members and the Club was blessed with good weather for the entire day. The trip was down to Tullynakill Graveyard, Nendrum, Ballydorn Lightship, lunch sitting outside Daft Eddies and then onto Inch Abbey and the Quoile at Downpatrick. The light was starting to fade just as it was time for home. An enjoyable day for everyone and plenty of photos taken for both pleasure and future competitions. Friday 12th October 2012 - Jim Moorland 'RPS Panels', start at 7:45pm, Clubrooms. 7:45pm, Clubrooms. Refreshments will be provided. Jim Moorland is well known for his entertaining talks and always brings along extremely high quality images. It will be a good night's craic. Please come along. All welcome. On Friday 28th September Ards Camera Club had to move to the nearby Silver Band Hall for the larger audience attracted by our visiting speakers, Guy Davies ARPS and Paula Davies FRPS from North Yorkshire. They brought a wide collection of prints and stories from their travels, ranging from the vast splendour of the Grand Canyon to the minutia of a broken glass tile in the street and rust on a car. Of particular interest was seeing how these two very different photographers viewed similar subjects. Even though they were often standing beside each other they viewed the world very differently and have captured an eclectic range of images. They also discussed the impact that different textures of paper can have on their prints. The audience was very appreciative and welcomed the opportunity to see their work in Northern Ireland. Thursday 4th October 2012 - Saturday 27th October 2012, Annual Photography Exhibition, Comber Library, Mon, Wed, Fri, 1000 to 1700 hr, Tue 1300 - 2000 hr, Thu 1000 - 1800 hr and Sat 1000 - 1400 hr. Friday 5th October 2012 - Raymond Hughes, 'Audio Visual Workshop', 7:45pm sharp, Clubrooms. Wednesday 10th October 2012 - Photchat theme, 'Achieving Sharpness Practical Night', 7:45pm, Clubrooms. Please bring your camera. Refreshments provided. Friday 12th October 2012 - Jim Moreland, 'Making your RPS Panels'. 7:45 pm, Clubrooms. Raymond Hughes DPAGB, AIPF, LRPS from Merville Newtownabbey Photographic Club has been invited to give a talk on Audio-Visual photography. This used to be done with slide projectors and a lot of fancy machines to sync the audio with the images on screen. Now all this has been digitised and Raymond will show us how things have moved on. The interest of Audio-Visual photography runs alongside stills photography for many people. Please come along and see how technology has been used to full advantage. Congratulations to all those who entered as well to those who won places. Thank you to all our members for coming along to make the night a success and also to our esteemed critique, Balfour Stalker, past president of NIPA and active member of CPA Camera Club. Friday 28th September 2012 - Paula and Guy Davies Event - 'Double Act', Silver Band Hall, Comber Road, Newtownards, 7:30pm sharp. Parking is available at Ards Camera Club within a short walk to the hall. Wednesday 3rd October 2012 - Photochat - October theme is 'ISO and Achieving Sharpness'. Theory, discussion and tutorials, 7:30pm with refreshments provided. Ends Monday 1st October 2012 - Ards Camera Club Annual Exhibtion, Ards ArtsCentre, Townhall, Conway Square, Newtownards. Guy Davies ARPS, likes landscape, preferring to see the 'big picture' while Paula Davies FRPS, enjoys intimate details of images and applying creative Photoshop. It is always good to see other photographers of such high calibre and how they see the world through their images. Please come along and support the Club. Everyone welcome. Tickets are £5 on entry. Ards Camera Club would like to thank Ross McKelvey ARPS DPAGB BPE2* for his aptly entitled 'Passion for Prints' talk. Ross gave a synopsis of the various types of photographic qualifications which provides letters after the recipient's name. Ross showed a selection of his own prints to show what is possible with some Photoshop knowledge, a lot of in-camera skill and loads of passion. Thanks to Ross for such an entertaining and enjoyable night. Friday 21st September is Northern Ireland Photographic Association (NIPA) Round 1 'Open' theme competition. Everyone welcome. Please come along for the craic. The special event, 'Double Act', Paula Davies FRPS and her husband, Guy Davies ARPS, will take place on Friday 28th September 2012 at Silver Band Hall, Newtownards, 7:30pm sharp. Tickets £5 at the door. Friday 21st September 2012 - NIPA Round 1 'Open' competition, Clubrooms, 7:45pm sharp. Wednesday 26th September 2012 - Photochat and Problem Solving, September theme 'composition.' 7:45pm sharp. Friday 28th September 2012 - Paula Davies FRPS, and Guy Davies ARPS, 'Double Art', Silver Band Hall, Newtownards, 7:30pm sharp. Everyone welcome, all levels from those who just want a good night's craic to those who have a competitive streak. Please come along this Friday and see the variety of work produced by the Club. 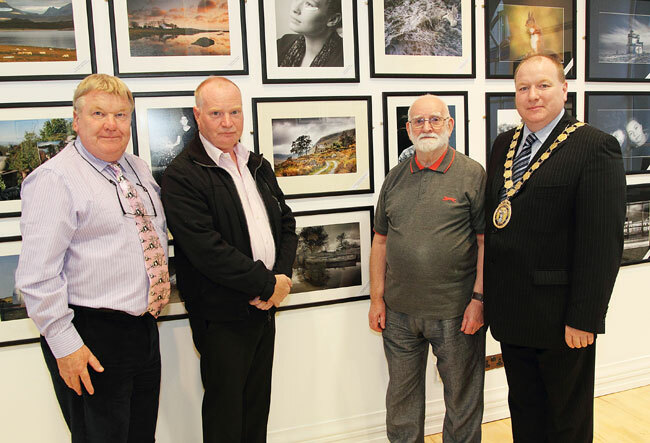 Friday 7th September 2012 was the Opening Night for Ards Camera Club Annual Photography Exhibition at Ards Arts Centre, Conway Square Newtownards. The entries had been judged at a pre-arranged date by our guest judge, Brian Bennett ARPS. The winning prints were placed on one wall with the rest around the beautiful, new space of Ards Arts Centre. The night started with our Chairperson, Leslie Armour, introducing the Mayor, Alderman Hamilton Gregory, who gave a brief speech complimenting the standard of our exhibition. Then Brian Bennett, our guest judge, was asked to say a few words about the winning prints. He was very complimentary about the overall standard and talked about his favourite prints and the overall winner for top print, a landscape called 'The Old Homestead' by Sinclair 'Rusty' Adair. The Vice Chairperson, Linda Hutchinson, was introduced to announce the prize winners for the exhibition and also for the Club competitions. Club medals and certificates were presented to the winners. The projected digital images and a short slide presentation by David S Adair were shown, after which supper was served. The Club would like to thank the guest judge, Brian Bennett ARPS, all the people who helped set up the exhibition and prize giving, the Ards Arts Centre for hosting the exhibition, and especially to the entrants and everyone who came along to support us on the opening night. The exhibition runs from Friday 7th September 2012 until Monday 1st October 2012. The entries are the culmination of much hard work and effort over the last season to produce the final prints, so please come and support our members. The first night of the season in the Clubrooms will be this Friday 14th September 2012. Ross McKelvey will be giving a talk entitled 'Passion for Prints.' It promises to be an entertaining night, so come along early to get a good seat. Friday 14th September 2012 - 'Passion for Prints' by Ross McKelvey, Clubrooms, at 7:45 pm. Wednesday 19th and 26th September 2012 - Our new 'Wednesday Night Programme', Clubrooms at 7:30 pm. The theme for September is 'Composition'. Tea and biscuits provided. Friday 21st September 2012 - Inter-Club Round 1 'Open' theme, 7:45 pm sharp. Projected digital images (PDIs) may be submitted to Peter Knott in advance. Details will be announced this Friday 14th September 2012. Friday 28th September 2012 - Paula Davies FRPS. Details to be announced. Tickets cost £5 and can be purchased on the night. Everyone welcome, all levels from those who just want a good night's craic to those who have a competitive streak. Please come along this Friday and be enthralled by the passion of Ross McKelvey for prints. 'Annual Photography Exhibition 2012' is being held by Ards Camera Club running from Friday 7th September to Monday 1st October 2012. The Opening Night on Friday 7th September and starts at 7:30pm sharp. Everyone is welcome. The exhibition is being held in the Townhall, Conway Square, Newtownards, during Townhall opening hours, Monday to Thursday 9am - 4:30pm and Friday to Saturday 10am - 4pm. The first Clubnight of the season at the clubrooms will be held on Friday 14th September 2012, 7.45pm sharp start. Everyone welcome. The first competition night will be 'Open' theme, Friday 21st September 2012, a good night's craic with audience participation. Thursday 6th September 2012 - Helpers needed to put up prints in Townhall, meeting at 7:00pm sharp. Friday 7th September 2012 - Ards Camera Club Annual Photography Exhibition Opening Night, 7:30pm sharp, Townhall, Conway Square, Newtownards. Friday 14th September 2012 - First meeting of the season at 7:45 pm, Clubrooms, junction of South Street and Circular Road, opposite Cricket and Rugby pitches. Directions are on our website. Our website galleries are being updated. Anyone who would like to see their photos on the website, please contact Peter via our Club email ardscameraclub@yahoo.co.uk. The Club has a selection of old photos from previous exhibitions. If anyone would like to retrieve their photos, please contact Peter via our Club email or any committee member at the Clubrooms on a clubnight. The Opening Night for Ards Camera Club 2012 Annual Photography Exhibition is 7th September 2012, and starts at 7:30pm, Townhall, Conway Square, Newtownards. This is the only time the projected digital images (PDIs) will be on display. Please come along and join us. Everyone welcome. Refreshments will be provided. Friday 31st August 2012 - Blue Moon. Friday 7th September 2012 - Annual Photography Exhibition, Townhall, Conway Square, Newtownards. This will start at 7:30pm sharp. Our website galleries are being updated. Anyone who would like to see their photos on the website, please contact Peter via our Club email ardscameraclub@yahoo.co.uk. The Club has a selection of old photos from previous exhibitions. If anyone would like to retrieve their photos, please contact Peter via our Club email as above before Friday 7th September 2012.